Microsoft has released Windows 8.1 RTM to the public and is available as a free update to existing Windows 8 users. While Windows 7, Vista, and XP users have to purchase Windows 8.1 in order to upgrade to newest version of Windows, Windows 8 users are eligible for the free upgrade and can upgrade to Windows 8.1 without losing data and installed programs. As you probably know by now, Windows 8 users can download Windows 8.1 upgrade setup by launching the Store app and then clicking the Get Windows 8.1 for free tile. The downside of this method is that the downloaded setup file upgrades your existing installation to Windows 8.1 but doesn’t offer an option to create and save an ISO image of Windows 8.1 that you might need when performing Refresh PC and Reset PC operations. Users who have genuine license of Windows 8 or Windows 8.1 can download the official ISO copy of Windows 8.1 from Microsoft and then create a bootable DVD/USB from the ISO file to begin installing or reinstalling Windows 8.1. Even though the downloaded ISO from Microsoft can’t be used to perform a fresh install of Windows 8.1, you can use it for Refresh PC and Reset PC operations. Complete the given below instructions to download Windows 8.1 ISO file from Microsoft by entering the license key. Follow this method if you have a Windows 8.1 license key. Skip to Method 2 if the license key belongs to Windows 8. And if you’re not sure whether the product key belongs to Windows 8 or Windows 8.1, we suggest you follow this method first and if you’re not able to download the ISO file using the key, follow instructions in method 2. If you have lost the product key, follow our how to recover Windows 8/8.1 product key and how to recover Windows 8/8.1 product key without using third-party tools. Step 1: Visit this page, scroll down, and click Install Windows 8.1 to download Windows 8.1 setup file (it’s just 5MB) on your Windows 8 or Windows 8.1 PC. 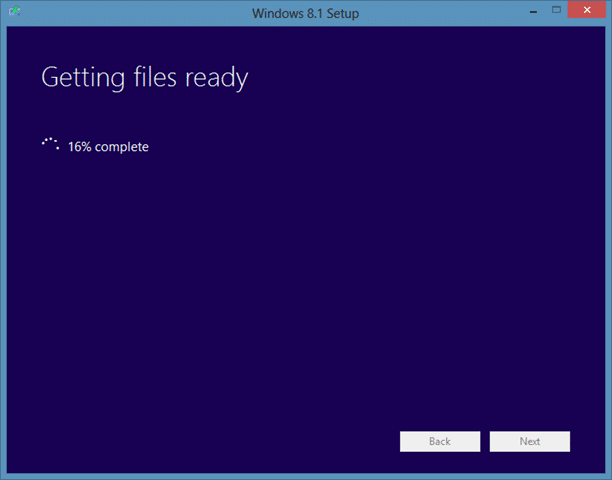 Step 2: Run the downloaded Windows 8.1 setup file. Note that a single setup is available for both 32-bit and 64-bit systems. Step 3: When you’re prompted, enter your Windows 8.1 product key (if you have Windows 8 product key, skip to Method 2), and then click Next button. Click Next button to begin downloading your Windows 8.1 installation files. 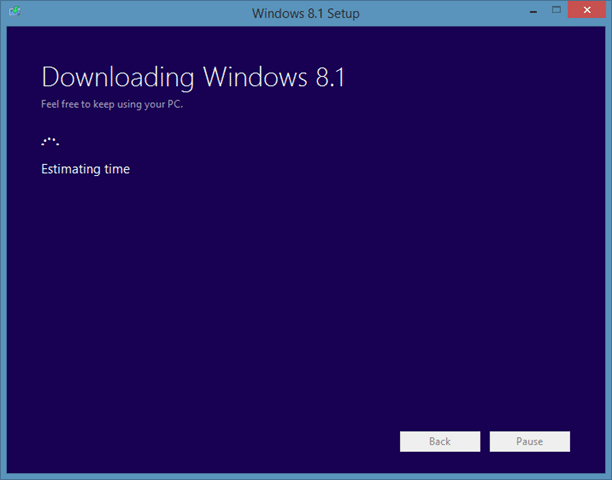 Depending on the version (32-bit or 64-bit) of Windows 8/8.1 is installed on your PC, the setup will download x86 or x64 installation files. The time required to download installation files largely depends on your internet connection speed. 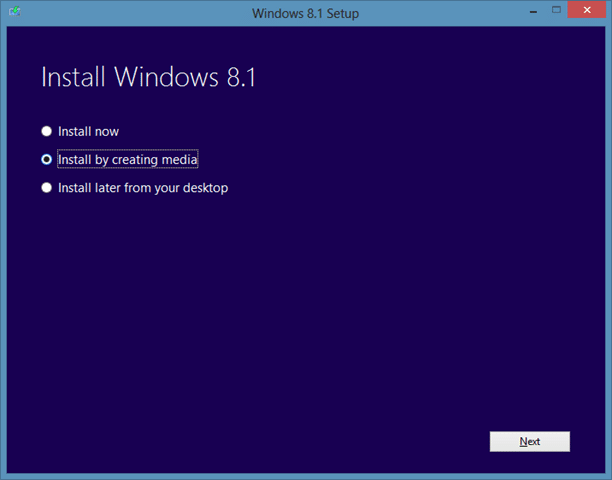 Step 5: Once installation files are downloaded on your PC, you’ll see the following three options: Install now (install Windows 8.1 right away), Install by creating media (create bootable media or create ISO), and Install later from your desktop (to manually initiate the installation later from desktop). Select the second option titled Install by creating media and click Next button. Step 6: Finally, select the ISO file option (selecting USB flash drive creates bootable Windows 8.1 USB) and click Save button to create Windows 8.1 bootable ISO and save the file. You’ll be prompted to select a location to save the ISO file. Click Finish button. That’s it! 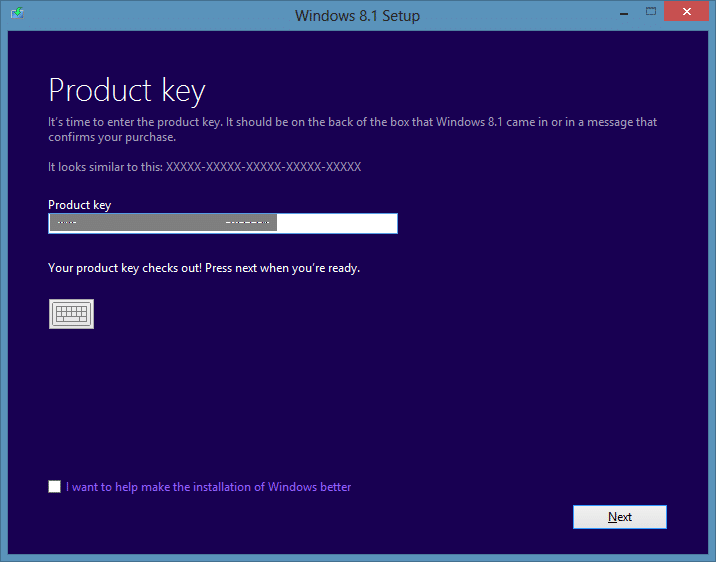 Use this method to download Windows 8.1 ISO using your Windows 8 product key. Step 1: Head over to this page and click on Install Windows 8 button to download Windows 8 setup file (~5MB). Step 2: Launch the setup file, type your Windows 8 product key when you’re asked to do so, and then click Next button. 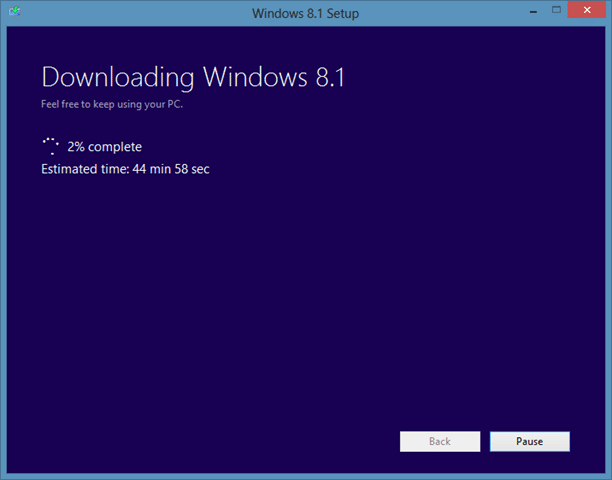 Click Next button to begin downloading Windows 8 ISO file. We know, you’re here to download Windows 8.1 ISO and we’re not going to download the full ISO file (move on to the next step to know how). 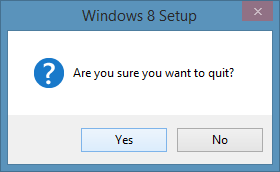 As soon as the setup starts downloading Windows 8 ISO file, click on the Close button and click Yes when you see the confirmation dialog to terminate the download process. 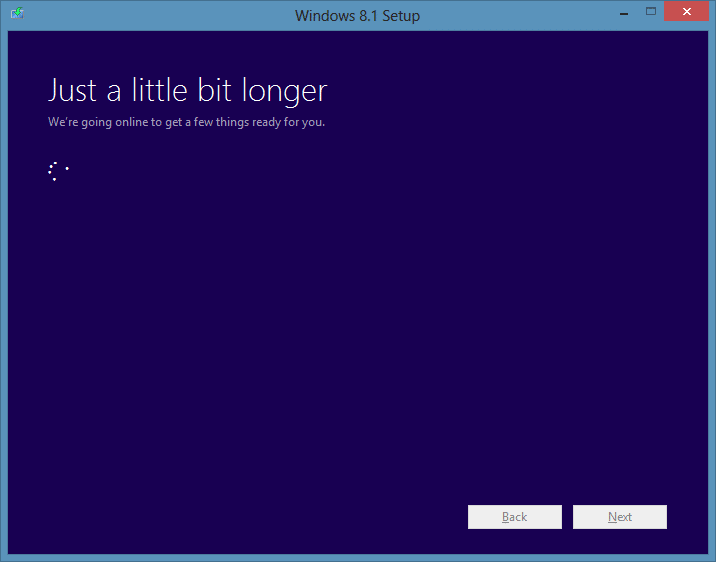 Step 4: Head over to this page again (the same page that you visited in Step1), and this time, click Install Windows 8.1 button to download the setup file. Step 5: Run the newly downloaded setup file to begin downloading Windows 8.1 installation files. Select the option titled Install by creating media and click Next button. Step 7: Finally, select the option titled ISO file and then click Save button create and save your Windows 8.1 ISO file. That’s it! Once you have the ISO file of Windows 8.1, you can follow our how to install Windows7/8/8.1 from USB drive guide to prepare the bootable media. I HAVE INSTALLED WINDOWS 10 TECH PREVIEW. I WOULD LIKE TO GO BACK TO MY PREVIOUS OS (0WIN 8.1). BUT I DONT HAVE THE KEY WITH ME. (IT WAS INSIDE THE BIOS). SO HOW CAN I RETRIEVE IT BACK? very easy downlaod windows 8.1 and it works 100%, only searh @@windows 8.1 key_sale@@@ from bing. I purchased Windows 8 Pro which was updated to Windows 8.1 Pro and the updated by Microsoft to Media center Edition free. Trouble is I am having DVD for Windows 8 pro only. When I tried to download Windows 8.1 Pro ISO from Microsoft’s website it asks for product id which was entered properly and correctly but it says that product id did not work! 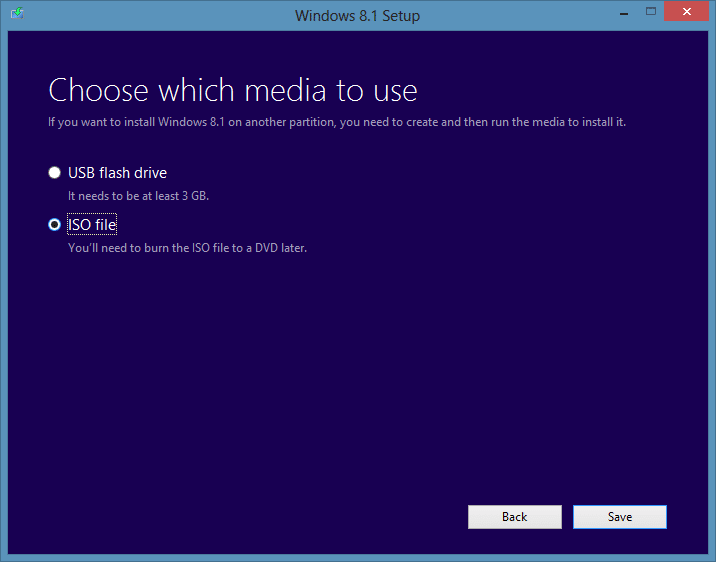 Can someone help me to obtain a ISO file of Windows 8.1 Pro with Media center with my product id. I am having the same problem as Chandu. Please provide solution. Thanks! After terminating the download process of Windows 8, and then running newly downloaded 8.1 setup file, it is asking for Product Key instead of starting downloading. I have Gunine Windows 8 product key which was purchased, but it is not applicable for Window 8.1 and Im not able to proceed further. 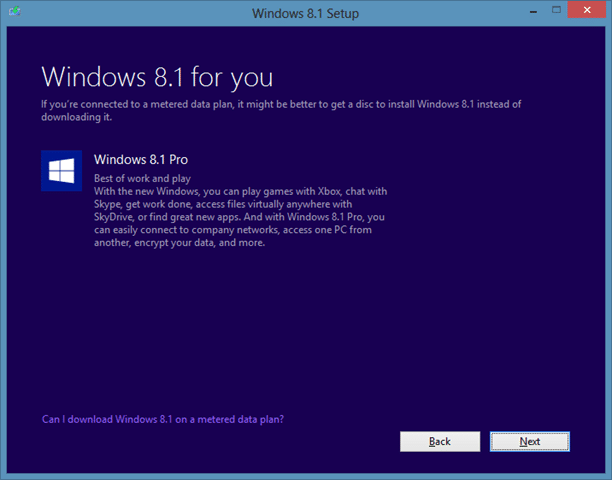 Has anyone able to download Windows 8.1 using Method 2? If yes, what did you do to bypass Product Key validation at Step 5? Try looking at the control panel and took at the pointing devices. See if there is just an adjustment that is needed. Also go to the computer manufacture and see if they have an update for 8.1. Many have been updating their drivers. If it is an older laptop, 3 or more years, you may need to have the bios updated. If you know a lot about computers and are comfortable with major changes, you can do this yourself. If you are not sure, take your computer to someone who knows how to do this. Messing up the bios can cause a big problem. I build custom computers for non-business use. I just don’t want the liability of loss of income at a business that they might think I am responsible for. Building computer for over 20 years.